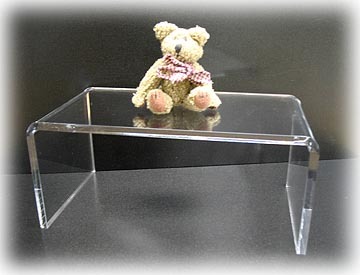 Our clear acrylic, Lucite, risers and displaying stands are great for showing products or special sale items in stores, malls, or any novelty shop. Also can be used in and around your home to add more space to a bookcase, desk, or any wall shelf. They let you raise the items that get stuck in the back of a collectors showcase for all to view. 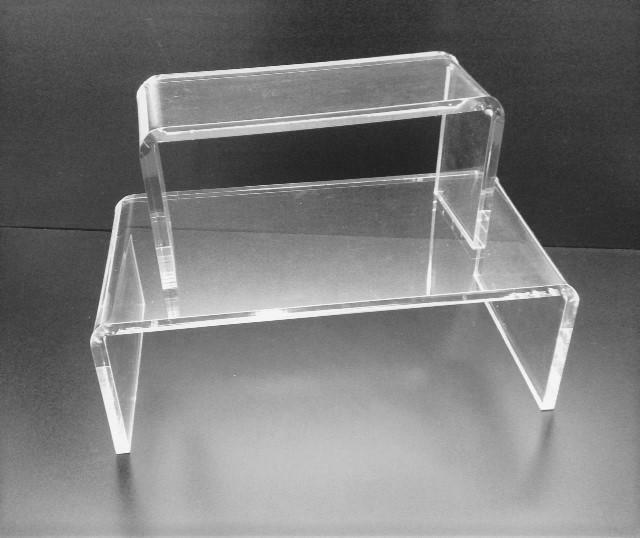 Our risers are made from 1/8", 3/16", 1/4", 3/8", and 1/2" thick clear acrylic material. Custom risers can be produced up to 3/8" thick for items over 15 lbs. Keep in mind the weight of your displaying item and be sure to keep proper riser thickness for your application for lighter items as to heavier. RV's, Campers, cabins, kitchen, lunch room, office, desk, etc. Go to our FORM PAGE for a quote on custom size risers, add in description item displaying for proper riser thickness as to weight of item. Thicknesses from 1/8", 3/16", 1/4", and 3/8" thick. Need a custom size riser for that special place in your home or office? Click on the QUOTE FORM to send us your size for quote. Please remember to think about what you may be setting on this riser. This will determine the proper material thickness. Items and ideas for custom size risers.